For me, these days, it’s trying a new recipe and having it turn out to be as good as the picture looks. For one lucky blog commenter, it’s winning the stamp of their choice! For a little more on the stamp winner, scroll to the bottom of the post. This weekend I tried 2 recipes from Pinterest and BOTH were great. There’s no point in showing my photos since the original posters’ look far more appetizing. I have to say both of these will be part of the regular rotation around here. They def get the MOMMYDO two thumbs up. Tried it! So, so good. Like, leave-what-you’re-doing-right-now-and-go-to-the-store-and-get-what-you-need-and-go-home-and-put-it-in-the-slow-cooker-right-now kind of good. Quick and easy to prepare. Tastes super fab and is fancy enough company. Crock Pot Honey Sesame Chicken. Also super yummy and easy to make. The chicken is juicy and the sauce is sweet and tangy. We put both onto tortillas to make tacos one day and served on rice the next. 4 days worth of meals (with lunches) for less than 20 min prep each. What’s also awesome is winning a stamp! There weren’t a lot of comments, and I didn’t count my sister. 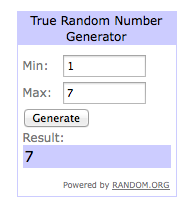 So, of the seven, it’s Lucky #7 that won. I’ll contact you to let you know you’ve won and give you the details. If you haven’t responded in 72 hours, I’ll pick a new winner. Thanks to Lindsay at The Penny Paper Co. for donating our wonderful prize. I’ll contact you with the details. cooked from scratchfoodMommyDorecipeWhy Is It Never Takeout Day?